Our school recently introduced a new software application “Credential Keeper” which is supposed to streamline the credentialing process of employees and students. This process has become increasingly complex due to ever-changing federal, state and institutional regulations. A quick calculation reveals the magnitude of the burden placed on a typical dental school: 320 DMD students + 60 DH students + 160 faculty + 200 staff = 740 individuals. Each individual is required to meet between 10 (non-clinical) and 25 (clinical) requirements = ~16,000 verifications school-wide. Storing, verifying, and ultimately safely destroying ~16,000 documents with various expiration dates have historically been an administrative nightmare. 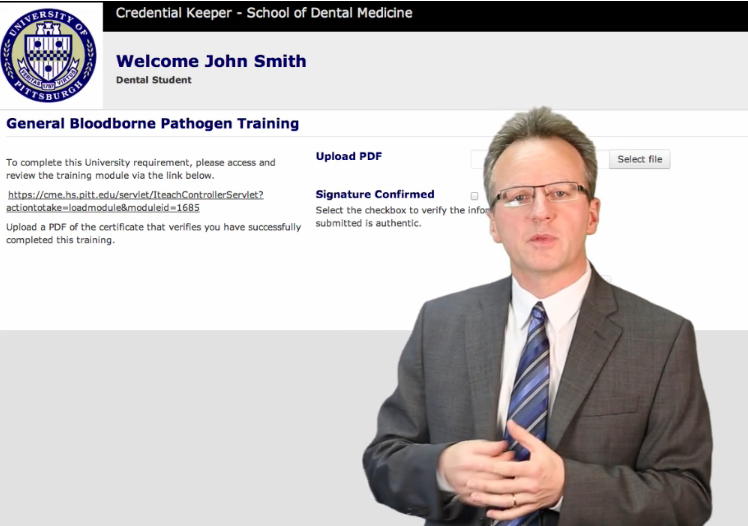 The Credential Keeper, a cloud-based software application developed by the University of Pittsburgh, School of Dental Medicine, helps to ease this process. But, how do we train users and help them understand the features, functions and limitations of the software? Writing technical user documentation has been not only an arduous task, but is rarely rarely appreciated by users who are reluctant to read software manual. Short of visiting each user individually, we attempted to combine the a visualization of the user interface with aspects of a typical social interaction by creating a walk-through video. The video was shot in front of a greenscreen and the post production was completed in Adobe Premiere Pro (see Figure 1): Credential Keeper on Vimeo.